This April 3 photo, taken in Washington, DC, shows President Donald Trump's Twitter feed. 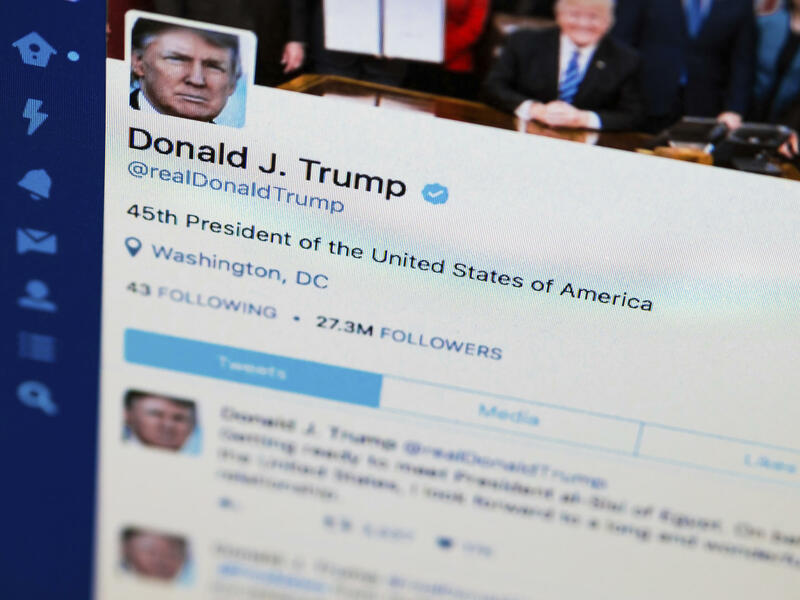 Some Twitter users argue Trump is violating the First Amendment by blocking people from his feed after they posted negative comments. President Trump is facing a lawsuit for blocking people from his Twitter account. This week some First Amendment advocates joined the suit — and they are making a novel argument about the right to communicate with the president in the digital age. One of the plaintiffs in the suit is Philip Cohen, a sociology professor at University of Maryland. Just like President Trump, Cohen likes to tweet. He saw an opportunity to express himself to the president by tweeting to the account @realDonaldTrump. "I noticed right away that his Twitter feed was a place that people congregated and exchanged views," he says. "So that was the place to go to express myself." Cohen has a verified account on Twitter — that's when you have a following and they confirm you are who you say you are. That means his tweets got to the top of the president's feed. Cohen set up an alert so that he could know when President Trump tweeted. "If I replied right away, I could get lucky and have a lot of people read my tweets," he says. But then, one day the president blocked him. Cohen was surprised. He says he wasn't trolling the president. "I was basically civil," he says. "I didn't use a lot of profanity. I didn't harass people individually. I mostly made graphical memes with slogans on them like 'corrupt,' 'incompetent,' and 'authoritarian.'" Cohen says once he was blocked, his tweets about the president reached fewer people. So he believes the blocking is censoring his ability to criticize the government. Cohen is now one of the plaintiffs in a ground-breaking lawsuit brought by the Knight First Amendment Institute at Columbia University. Katie Fallow, a senior attorney at the institute, says the suit is based on long standing First Amendment principles, "where if the government opens up a space or hosts a kind of public forum where they allow the public to speak, they can't exclude someone from that forum based on their views." The Twitter account @realDonaldTrump is the president's personal account. It was created before he became president. But Fallow says the president has used it to make official announcements. "Like the replacement for the FBI director after he fired James Comey, and the transgender ban" as well as a lot of other policy announcements, says Fallow. But it isn't just that President Trump uses the account to make official announcements. He also uses it to interact with the public. Josh Geltzer, the founding executive director of the Institute for Constitutional Advocacy and Protection at Georgetown University Law Center, says it's like a virtual town hall. The institute filed a brief in support of the blocked Twitter users. He says you can exclude people from a town hall for lack of space, but not for their opinions. He points to a recent case in Virginia where a federal court found the county could not block an individual from an official county Facebook page. Geltzer says the case was similar to this one. He says the county was trying to "shut out voices that weren't obscene or bullying, but voices that simply expressed criticism or unwanted viewpoints." No one from the Justice Department was available in time to speak to NPR. However in its brief, the government argues that this is the president's private Twitter account. He's using it just like everyone else. Twitter is private platform with its own rules. The president has a right to block people. All this makes for a novel case in the digital age. If the court finds against the president, it could certainly have implications on how government officials chose to use social media in the future. President Trump is facing a lawsuit for blocking people from his personal Twitter account. This week, some First Amendment advocates joined the suit, and they are making a novel argument about the right to communicate with the president in the digital age. NPR's Laura Sydell reports. LAURA SYDELL, BYLINE: If there's one thing most Americans can agree on, it's that President Trump likes to tweet. Philip Cohen, a professor of sociology at the University of Maryland, likes to tweet, too. And he saw an opportunity to express himself to the president on the president's @realDonaldTrump account. PHILIP COHEN: I noticed right away that his Twitter feed was a place where people congregated and exchanged views - mostly caustic but occasionally even constructive. So that was the place to go to express myself. SYDELL: Cohen has a verified account on Twitter. That's when you have a following, and they confirm you are who you say you are. That means his tweets got to the top of the president's feed. Cohen set up an alert, so that he could know when the president tweeted. COHEN: If I replied right away, I could get lucky and have a lot of people read my tweets. And then all of a sudden, he blocked me. SYDELL: So did you troll the president? COHEN: I was basically civil. I didn't use a lot of profanity. I didn't harass people individually. I mostly made graphical memes with slogans on them that said things like corrupt, incompetent, authoritarian. SYDELL: Cohen says once he was blocked, his tweets about the president reached fewer people. So he believes it's censoring his ability to criticize the government. Cohen is now one of the plaintiffs in a groundbreaking lawsuit brought by the Knight First Amendment Institute at Columbia University. Katie Fallow is a senior attorney at the institute. KATIE FALLOW: There are these longstanding first amendment principles where, if the government opens up a space or hosts a kind of public forum where they allow the public to speak, they can't exclude someone from that forum based on their views. SYDELL: @realDonaldTrump is the president's personal account. It was created before he became president. But Fallow says the president has used it to make official announcements. FALLOW: Like the replacement for the FBI director after he fired James Comey and the transgender ban and a lot of other policy announcements he's made for the first time via Twitter. SYDELL: But it isn't just that the president uses the account to make official announcements. He also uses it to interact with the public. Josh Geltzer says it's like a virtual town hall. Geltzer is a law professor at Georgetown University. He, along with other advocates, filed a brief in support of the blocked Twitter users. He says, you can exclude people from a town hall for lack of space but not for their opinions. He points to a recent case in Virginia where a federal court found the county could not block an individual from an official county Facebook page. JOSH GELTZER: Which was quite similar to here - to shut out voices that weren't obscene or bullying but voices that simply expressed criticism or unwanted viewpoints. SYDELL: No one from the Justice Department was available in time to speak to NPR. However, in its brief, the government argues that this is the president's private Twitter account. He's using it just like everyone else. Twitter's a private platform with its own rules. The president has a right to block people. All this makes for a novel case in the digital age. If the court finds against the president, it could certainly have implications on how government officials choose to use social media in the future. Laura Sydell, NPR News. Transcript provided by NPR, Copyright NPR.